Although these infections can happen at any age, they occur most commonly and are usually most severe in infants, young children, and the elderly. In severe cases, RSV infections can cause death. 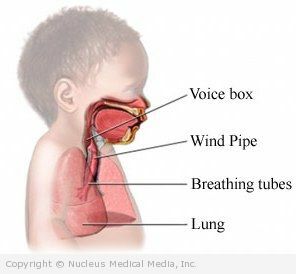 RSV is spread through infected fluids of the mouth and nose. The virus most often enters the body from touching the mouth, nose, or eyes. It can also be spread by inhaling droplets from a sneeze or cough. RSV is a very contagious virus. It can survive on surfaces and objects for hours and is easily passed from person to person. Virus shedding (contagious) usually lasts for 3-8 days, but may last for up to four weeks. The symptoms of RSV infection vary and usually differ with age and previous exposure to RSV. Very young children, the elderly, and people with chronic diseases are more likely to have severe symptoms. The doctor will ask about you or your child’s symptoms and medical history, and perform a physical exam. A variety of tests are available to diagnose RSV. Lab tests called antigen detection assays are commonly done using secretions from the nose. In most cases, antibiotics are not needed as the infection is caused by a virus and not a bacteria. Drink plenty of liquids, especially water and fruit juice, to help keep nasal fluid thin and easy to clear. Use a cool-mist vaporizer to humidify the air. This may help reduce coughing and soothe irritated breathing passages. Use saline (salt water) nose drops to loosen mucus in the nose. Use non-aspirin fever medicine, such as acetaminophen, as needed to reduce fever. If you or your child are diagnosed with RSV, follow your doctor’s instructions. Wash your hands often, especially after touching someone who may have a cold or other RSV infection. Avoid touching your face or rubbing your eyes. Do not share items such as cups, glasses, silverware, or towels with people who may have a cold or other RSV infection. If your baby has a high-risk of serious illness from RSV (eg, the baby is premature or has severe lung or heart problems), the doctor may recommend a medicine to help prevent infection. The medicine is given by injection monthly through the fall and winter in children under two years old. Talk with your child’s doctor to see if this medicine would benefit your baby.